Yahoo despite being in trouble in the stock market and in transition in management, is still working on innovations for their products. Little did anybody out of India know about a little experiment Yahoo has been testing called Glue(TM) Pages, which is basically a visual search result user interface. Tonight, Yahoo is launching a similar service for the US market which they are calling Yahoo! Glue(TM) beta . This newest iteration is a standalone experience focused on assembling useful information from all over the Web, giving users a new place to discover and explore images, videos, articles and more. Initially, Yahoo!Glue will start off with a limited number of topics and naturally will expand that base over time. 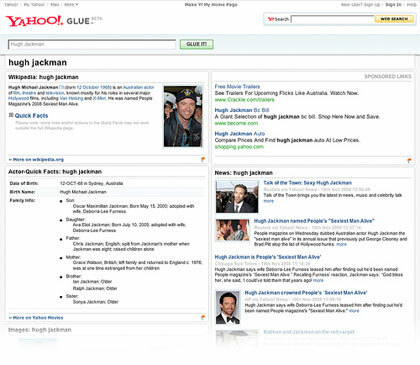 Yahoo!Glue is an experimental visual search results user interface which Yahoo hopes will make their search engine more attractive. So, how will this service work. Apparently some visual experiences like Google’s Lively aren’t working so well that they have to close down. Still, I hope Yahoo!Glue would be of some use to change the ever boring search result pages of Google and Yahoo, the 2 best search engines.